Watch our concerts live! Bookmark this page and check back one hour prior to concert start. UW-Madison Wind Ensemble, Sunday, February 17, 2:00 PM, Mills Hall. 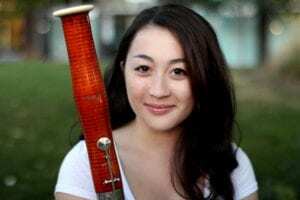 Featuring the inaugural winner of our Wind Ensemble Concerto Competition, bassoonist Midori Samson. Visit our official YouTube channel. Meet our 2018 Concerto Competition winners. Profile of Savannah Valigura, music performance major. Noteworthy Vision: In performance, Yeaji Kim’s fingers smoothly send music from the keyboard to listeners’ ears. In practice, though, being visually-impaired made it difficult to discuss printed scores with her sighted teachers. Exploring possible solutions, she turned her personal project into a doctoral thesis that could help musicians around the world. Kim graduated with a DMA in piano performance in May 2014. Soprano Anna Whiteway performs “Ah! Je veux vivre!” from the opera Roméo et Juliette by Charles Gounod.